This four part series has been filmed across 12 months, by Northern Pictures and Beach House Productions. This is narrated by Indigenous actor, Tom. E. Lewis. 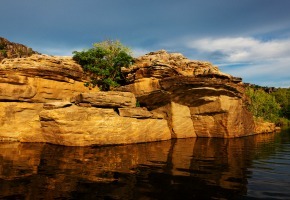 Kakadu goes behind the scenes of this natural universe. Through the rangers’ eyes, and those of the scientists and traditional owners who devote their lives to Kakadu, comes a deep insight into the elemental power of nature at dramatic extremes. In Kakadu, people are included among all living things, just another species fighting to survive. Microscopic creatures, insects, plants, aquatic life, reptiles, birds and humans – all are part of the dance of life and death, each with a powerful part to play. Ultimately Kakadu is a story of rebirth, renewal and change, of six seasons defined by the Bininj/Mungguy – the Aboriginal people of Kakadu – unfolding as they have for millennia. Each new season produces unique drama and beauty, nothing ever predictable, nothing staying the same. It’s taken a year of intense filming to bring this four-part epic to life – months of dedication working in searing heat and monsoon storms, deep in the heart of the living wilderness. The result is a front row seat on a journey of monumental scale. Since Kakadu is on my list of places to visit in Australia, I’ll be watching this special with interest.